Domestic flight prices aren't available yet, but we'll definitely survey them closer to the time when they are available. Domestic flight prices aren't available yet, but we'll definitely survey them closer to the time when they are available. November is the calm before the storm, as we start gearing up for summer and the festive season. As such, flight prices are fairly consistent throughout the month. With no school holidays or public holidays to create peak travel periods, the only increase in flight prices is brought about by weekend breaks which push Friday and Sunday flight prices up on some routes. Prices do increase slightly towards the end of the month as some universities start closing for the year and students are heading home. Kulula JHB to CPT : Affordable flights are available throughout the month. Dramatic price increases are only visible on the 22nd and the 29th. Kulula CPT to JNB : When possible, avoid travelling on Sundays as prices are elevated. Kulula Lanseria to CPT : Irrespective of your travel date, you're guaranteed of a cheap flight. Kulula CPT to Lanseria : Prices are incredibly consistent throughout the whole month. Kulula JHB to Durban : The first week of November is the most affordable to travel. 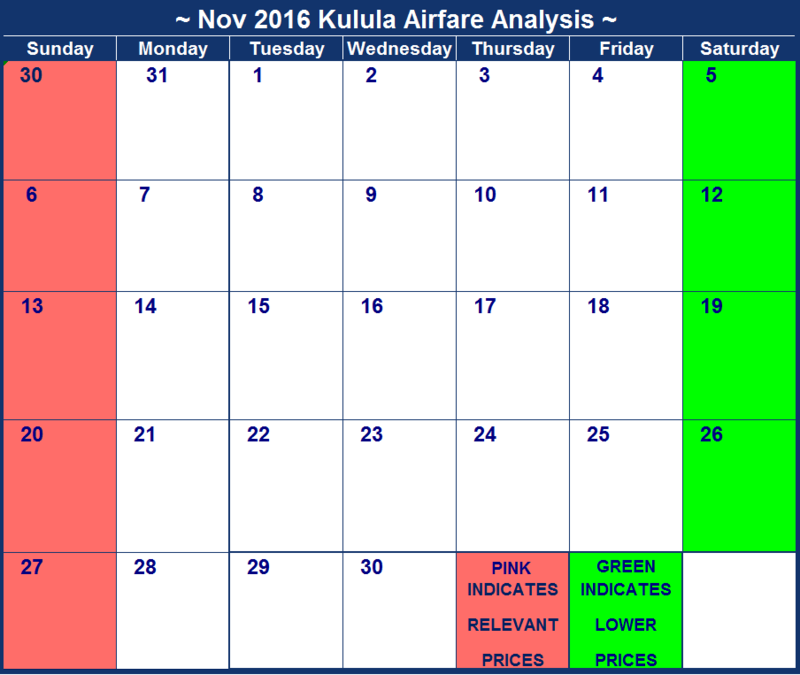 Kulula Durban to JHB: Look for dates highlighted in green if you are travelling on a budget as those are significantly more affordable. 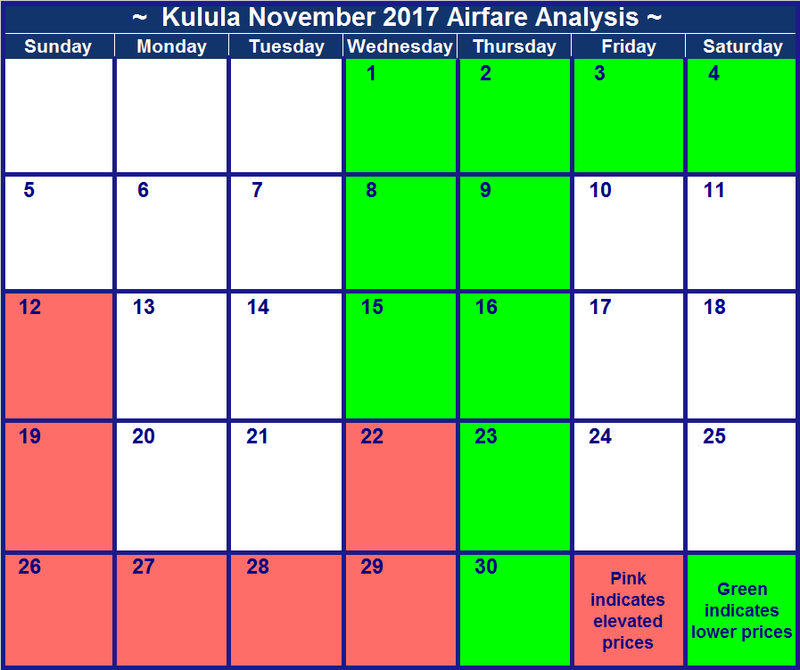 Kulula Lanseria to Durban : Avoid dates highlighted in pink if you are on a tight budget as those are slightly more expensive. Kulula Durban to Lanseria : Affordable flights are readily available throughout the month. 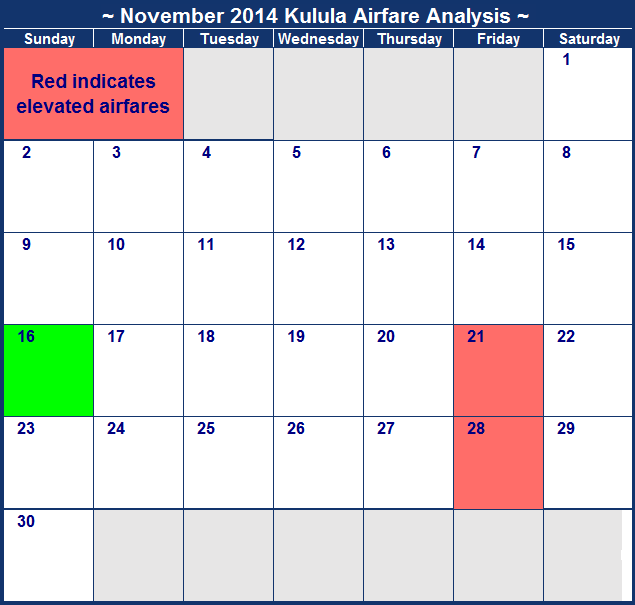 Kulula JHB to George : Avoid travelling on the 30th if possible, as that is the only date with elevated flight prices. Kulula George to JHB : Affordable flights are available throughout the month. Kulula CPT to Durban : Sundays are typically the most expensive days of the week to travel on. Where possible, avoid travelling on the 12th. Kulula Durban to CPT : Sunday and Friday flights are the most expensive days to travel on with the 12th and the 26th of November being exceptionally expensive. Kulula JHB to East london : Flight prices are incredibly consistent throughout, except for Friday flights which are slightly elevated. Kulula East London to JHB : Cheapest prices on this route are all the same. There are slight price increases on Sundays. November is fairly uneventful (at least in South Africa!) with the busy festive season right around the corner! This is the perfect time to take a few moments for yourself, regroup before the family swings around for Christmas and maybe even go on a little getaway. Flight prices are fairly consistent throughout the month, with prices only slightly hiked up over the weekends. If you are travelling on a budget, then mid-week flights are the way to go. Kulula JHB to CPT :Affordable flights are available throughout the month. Slight price increases are visible on the 3rd, 4th and 11th. Kulula CPT to JNB : When possible, avoid travelling on the 13th of November 2016 as prices are slightly elevated. Kulula Lanseria to CPT : Cheapest prices on this route are all the same. Kulula JHB to Durban : The difference between the cheapest and most expensive flight is nominal, making it easy to find affordable flights this month. Kulula Durban to JHB: Tuesdays are only marginally cheaper than other dates this month. Kulula Lanseria to Durban : Avoid travelling on the 26th of November where possible, as all the other days offer cheaper flights. Kulula JHB to George : Avoid travelling on the 3rd, 10th, 11th and 30th where possible. Kulula George to JHB : Affordable flights throughout the month. Price increases on the 6th, 13th, 20th and 27th. Kulula CPT to Durban : Sundays are typically the most expensive days of the week to travel on. Where possible, avoid travelling on the 13th. Kulula Durban to CPT : Sunday and Friday flights are the most expensive days to travel on with the 18th of November being exceptionally expensive. Kulula JHB to East london : Cheapest prices on this route are all the same. There are increases on the 4th, 11th, 18th and 25th. Kulula East London to JHB : This route continues the trend set by JHB to East London, as all of the prices are the same, except for an increase on the 27th. We hope to get around to surveying November flight prices soon, but perhaps the flight prices from last year might be helpful? Please find those below. Although prices won't be the same it could help establish peak travel dates to avoid during the month. November is the worst month of the year, as there are no public holidays & no school holidays - so we graft hard in Novembers, but we fully make up for it in Decembers, with the plethora of public holidays & school holidays. Because there are no special dates in November to holiday (eg as a result of long weekends), Kulula airfares are pretty level over the month. The airfares listed below are the cheapest we could find on each day in November 2014, when we set this up. We set this survey up on the 8th April 2014 - the longer the amount of time that has passed since we set it up, the greater the probability that airfares have changed. Check current airfares at Kulula.com. Kulula JHB to CPT : Try fly on the 16th of November 2014 - the price on this date is lower than all the other of the month. Kulula CPT to JNB : Flights on the 2nd and 28th are the most expensive, but once again the 16th is the cheapest date to fly on. Kulula Lanseria to CPT : Lanseria to Cape Town gets exactly the same comment as for OR Tambo to Cape Town - try fly on the 16th as it's the cheapest. Kulula CPT to Lanseria : The prices on this route are pretty uniform, except for the 16th, which seems to be a lucky date. Kulula JHB to Durban : Try not to travel from OR Tambo to Durban on Fridays in the second half of the month, as flight prices are elevated. Kulula Durban to JHB:The cheapest prices are exactly the same for every day of November for this route (within each date airfares do vary), which makes budgeting for your trip less complicated. Kulula Lanseria to Durban :Friday seems to be the day to avoid flights on this route, as prices are much higher than on other days. Kulula Durban to Lanseria :This route takes a page out of Durban to JHB's book, as prices are uniform throughout the month. Kulula JHB to George : The 26th boasts the lowest airfare for this route, and the 28th is the most expensive date. Kulula George to JHB : Prices on this flight route are all the same, so take your pick. Kulula CPT to Durban :Sunday the 9th is the odd one out, so pick a flight that leaves on any of the other dates. Kulula Durban to CPT : The 4th and the 5th November 2014 have the highest airfares. Kulula JHB to East london : Cheapest prices on this route are all the same.